Present Unit Hosts : Guyver 1 (Gigantic Guyver) and Guyver 3 (Gigantic Dark). Height : Varies with host but adds ~91 cm (~3 Feet), with proportional increase to host units physical dimensions. Weight : Varies with host but adds ~132 kg (~291 Pounds) to host mass. Status : Presently only 2 such units exist. 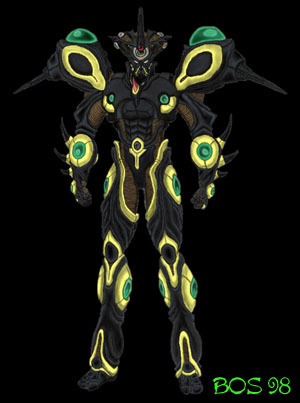 Description: Unit is the result of a merger of a Relic with a host Guyver Unit. It was originally created accidentally by the destruction of the Relic, while Guyver 1 was still physically linked to the Relic’s Navigational Spheres, during the battle at Relic’s Point between Guyvers 1 and 3 against the Supreme Zoalords of Chronos. 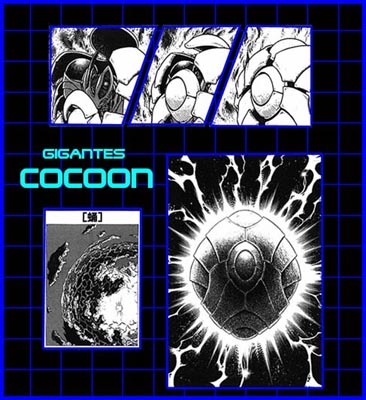 The Gigantes Cocoon was quickly formed around the Relic pilot (Guyver 1) at the moment the Relic was destroyed when the Zoalord Archanphel redirected the three mega smasher beams from both G1 and G3 back at them. It then teleported out of Relic’s Point protecting both the pilot and Relic Navigation Spheres from further damage. This is most probably a Uranus equivalent of a pilot ejection module, except with the biological instinct to protect both the host pilot and Relic Navigation Spheres from any physical threat. This combined with host pilot Guyver factor and host desire for the power to protect those he cared for produced an entirely new mutation. The end result was an armor upgrade that increased the size of pilot unit to Gigantic proportions, greatly increasing the host unit’s offensive and defensive capabilities to levels rivaling those of the Zoalords. It can be used by any Guyver, much like the Relic itself could have been piloted by any being with a compatible Control Medal. Unfortunately the conditions required for the creation of such a unit is extremely hard to reproduce, so the likelihood of another such unit being created is unlikely. 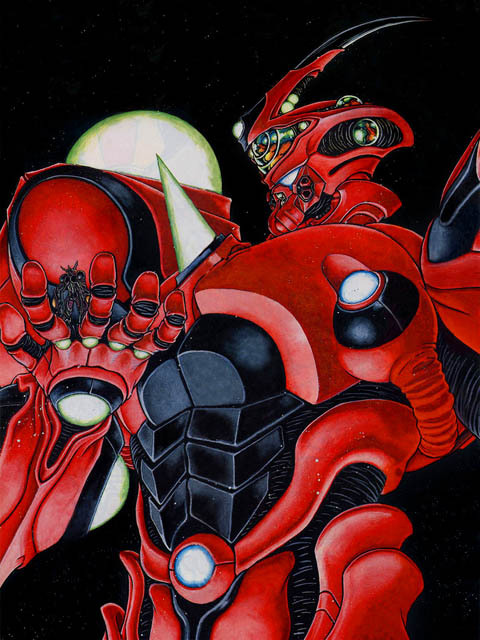 Fortunately, an identical unit has been acquired from the alternate reality that the Warrior Guyver 2 originated from, so two such units are presently available to ACTF Guyvers. Present estimates of a Gigantic Guyver’s abilities have been compiled and summarized below. Unit’s further enhanced physical makeup, greater mass, and greater internal energy levels easily sextuples host unit’s physical strength to that of ~700 men but this is further enhanced by the 12 gravity amplification crystals located throughout the Gigantic form that increases the raw power of the host unit twenty fold over host unit’s kinetic amplifiers. Properly channeled this power vastly increases the defensive and offensive capabilities of the host Unit while utilizing the Gigantic. Unit augments the host Unit’s Bio-Boost process with additional capacity and two additional gravity control orbs, increasing the total number to three. Each of which siphons energy from the Boost dimension to supplement the energy reserves obtained by the initial Bio-Boost. Additionally, 12 gravity amplification crystals located throughout the body of the Gigantic form boosts the energy obtained from the three gravity control orbs, as well as augments the host unit ability to manipulate and control that power. Granting the Unit 20 times the raw power of the host unit. This immense power is only countered by the increased energy requirements of the Gigantic’s more powerful weapon systems. So if the host subject uses up too much energy too quickly, such as with a full duration and full powered discharge of the Giga Smashers, especially after a prolonged battle, then the Gigantic Unit can collapse and auto-deactivate and require significant time to recharge before the full power of the Gigantic can be used again, but this is usually only encountered if the Unit had been shared and hadn’t been given time to recover energy reserves between use. The Unit increased physical power allows for significantly faster speeds than host unit is capable of, though, maximum speeds has yet to be accurately determined. Reflex speed appears increased to 10-100 times normal, though actual effectiveness is a bit less due to the difficulty of maneuvering such a massive physical form, which possibly limits the unit’s maximum physical ground speed to only up to about 500MPH when accelerating in a straight line but the subject’s vastly augmented gravitation power allows for acceleration to hyper sonic velocities easily in excess of mach 5, which can be achieved with rocket like acceleration when unit’s plasma back thrusters are engaged, which are usually engaged when any of the Unit’s high speed attacks are utilized. The Unit should be capable of accelerating to near light speed in space. Since unit was derived from the remains of a Creator Relic Space craft, unit is technically capable of jumping into hyper space (boost dimension) for traveling great distances. Though, this phenomena has only ever been performed while unit was still within the protective Gigantes Cocoon (a.k.a. Chrysalis), and appeared to the still unconscious host had something to home in on. So, unlike the Warrior Guyver system it doesn’t appear this ability can be used tactically and has the potential downside that it does not use a tunneling method and thus only beings capable of surviving the raw energy filled environment of the boost dimension can survive the trip. The Gigantic grants three additional hyper sensor orbs which combined and enhanced by unit’s greater power levels greatly increases the range of the active scanning range to an estimated 10 kilometers (~6.21 miles) and passive range to nearly five times that range. Armor is denser and thicker than the host unit’s, which grants it enhanced durability several times greater than the host unit’s that also augments with a much greater ability to withstand damage without impairing the host with pain and thus requires significantly greater levels of damage to impair the fighting capabilities of the Gigantic, though initial activation of the upgrade results in the near instant regeneration of host unit from any injuries suffered before hand. While a severed limb, if it retains an intact power amp crystal can also be controlled remotely and even be re-attached as a further augmentation over host unit’s abilities. Unit also has the ability to focus gravitational power to produce a powerful omni-directional bubble like EM shield, with a variable range that allows it to be used to shield nearby objects. Similar to a Zoalord’s barrier shield, it has been shown to be easily capable of withstand Zoalord level attacks and even withstood for a time the shearing forces of a virtual black hole. The shield has even been shown to allow the unit to survive a direct hit from a massive multiple simultaneous lightning bolts attack, such as that produced by the then Supreme Zoalord Purg’Stall, though it resulted in the destruction of the unit’s crystals, due to the massive energy overload. This leaves the unit nearly defenseless while it regenerated the damaged systems. While rarely done, this ability can also be combined with a directed pressure cannon shield and the combination can allow unit to withstand even a single Giga Smasher level attack but any more would require the Unit to transform into the Exceed form. Unit quintuples power of host unit’s main head beam orb and adds two more standard orbs, adjacent to each other, on either side of the Control Medal, granting a total infrared laser capacity of 7 times that of host unit’s norm. The three orbs can also be fired either together or independently at multiple targets simultaneously. –GRAVITATIONAL POWER: Unit adds two additional gravity control orbs to host unit’s mega smasher chest plates that, combined with unit’s increased power and channeled through the Unit’s gravity amplification crystals, allows for the Gigantic to generate and control immense gravitational power. –GRAVITY KNUCKLES: This powerful attack is usually produced when unit fires its back thrusters for rocket like acceleration and channels the unit’s gravitational power through the gravity power amplification crystals, producing a focused charge of gravitational energy with twenty times the power of the host unit into a single point in front of the fist, for a powerful discharge equivalent to the kinetic energy of one thousand tons of TNT. The devastating power of this attack is so potent that it doesn’t matter whether it contacts the target or not as the force of the blow travels like a directed explosive blast wave that can easily take out a small army of zoanoids in a row at once. Even if the blow is directed at the ground the resulting blast wave can still take out all surrounding zoanoids surrounding the subject up to a hundred feet away. 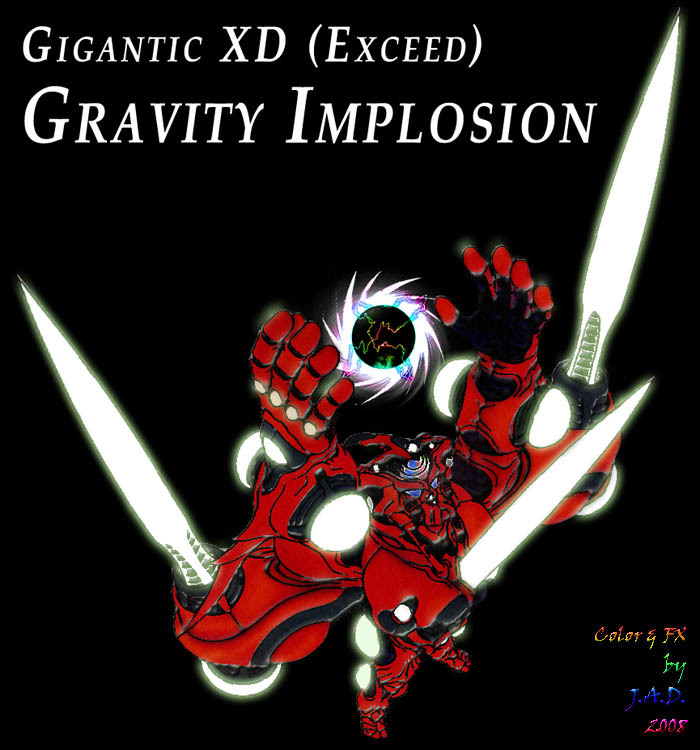 –GRAVITY RAM: This powerful attack is similar to the Gravity Knuckles attack except that the chest spike extends into a spear like vibrational extension and the omni-shield is activated as the back thrusters accelerates the Gigantic to its target, channeling the unit’s gravitational energy to produce an extremely powerful ramming attack that rivals the power of the Gravity Knuckles. Additionally the use of the omni-shield renders this attack virtually un-counter-able as the subject is simultaneously protected as the attack is performed. –PRESSURE CANNON: The Unit amplifies the power of this attack over 20 times the power of host unit’s normal capability but the power of this weapon can be focused and magnified while the Unit maintains a stationary position on the ground to fire a single massive pressure cannon blast. –GIGA PREASSURE CANNON: Unit can focus its total gravitational power to produce a massive Pressure Cannon with up to 100 times the power of a normal pressure cannon and can easily blast a massive skyscraper in half, while obliterating a good portion of it in the process. This powerful attack is rarely used because of the several seconds needed for it to charge up and the stationary position the user must hold until the weapon is fired. Since this weapon focuses the total gravitational power of the Gigantic and fires with such force that it will knock the user back a few feet, further if user is not braced properly. But the weapon can be used if the Gigantic does not have sufficient energy left to fire the Giga Smashers. –GRAVITY IMPLOSION: Similar to how the subject normally produces a Pressure Cannon, the Unit’s ultimate gravitational attack utilizes the full power of the three gravity control orbs channeled through the 12 gravity amplification crystals and focused to a single point. Ultimately forming a mini-black hole, with the shoulder gravity stabilizers spikes and the sword like chest spike fully extended and directed upward to fire this attack. Such is the power of this attack that it can absorb the power of a Giga Smasher level energy attack and still destroy the target before it finally evaporates. The down side to this attack is the long period of time it takes to charge up is greater than the time it normally takes to charge and fire the Giga Smashers but this attack is preferable to reduce collateral damage that countering Giga Smasher level attacks can produce when they collide. Number and arrangement vary according to host unit characteristics but provide significant augmentation of host unit’s with up to a 3 meter reach when extended as swords but can be further extended by allowing the base to become a whip like tendril and the tip becoming a harpoon like vibrational weapon for long range attack of up to just over ~30 meters. Enhanced version of host unit’s Mega Smashers that fire a blast a hundred times more powerful and easily rivals the destructive power of a 10 Mega Ton explosion of TNT per smasher. This is achieved with the help of two additional gravity control orbs located on the Giga Smasher cell’s chest plates, that help boost beam power of host unit Mega Smashers, along with increased power provided by Gigantic unit and its 12 power amp crystals to produce this extremely powerful blast but this weapon is very draining and can only be used once or twice before it causes the Gigantic unit to auto self deactivate as its energy level drops below the level needed to maintain the Gigantic form. At full power this weapon can be fired for up to 5 continuous seconds. Sonic Emitters are also enhanced with additional emitters, varies with host unit but usually adds two to four additional emitters, that allow for unit to detune the emitted frequencies of the sonic emitters for a significant increase in effective range and power of host unit’s emitters by up to 20 fold. Allowing this attack to easily destroy building size objects up to a mile away. The secret to the Gigantic’s power is it’s ability to transform energy and channel it into its physical form. So in part it’s physical form is raw power, energy transformed into a physical construct through the Guyver/Gigantic organism. Which is why when too much energy is used up the unit will collapse and auto-deactivate. But through this lies the true power of the Gigantic and with a host with a strong enough will this power can be unleashed to create a Exceed form. Essentially a strong enough willed host can will the Gigantic to continuously siphon energy from the boost dimension/Hyperspace until the Gigantic can literally grow in size to 52 meters and grant itself a proportional increase in power that would make it the most powerful being on the planet. But creating this form is an act of will power and can’t be maintained indefinitely. Physical manifestation of this transformation is a significant enlarging of the 12 Gravitational Power Amplification Crystals as the the continuous energy siphon from the three Gravity Control Orbs causes them to fill like balloons with raw energy. The Gigantic then absorbs this energy and begins to grow. The Crystals then return to normal shape once the final size is reached. The exact power of this form is unknown but is expected to be proportional to the size increase. It is presently unknown if any of the Guyvers could also be capable of a similar feat as so far only Sho has been able to induce this effect in the Gigantic. 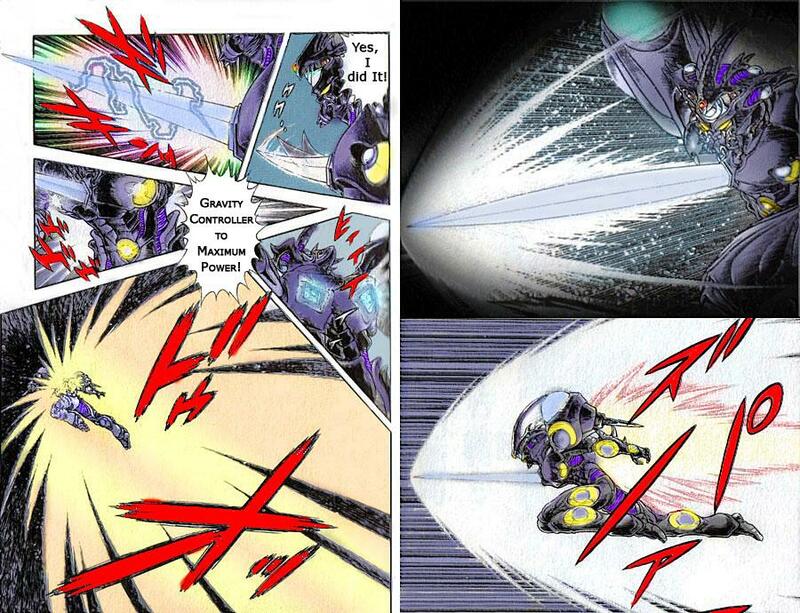 The Units responds to the host units with the strongest will, so another Guyver can not only wrest control of the unit and force the transfer of the unit upon him/herself, but also permanently lock out the previous host unit from doing the same thing. This explains why Chronos Guyvers have not been successful in taking control of the unit and Guyver 1 was reported to do the same to Guyver 3. Though unit abilities seem well defined, the unusual method of its creation leaves some doubt as to whether all of its abilities have been discovered. There has also emerged new forms of Gigantic upgrade modules, such as the Giant Unit and the Warrior Gigantic known as Dreadnought. 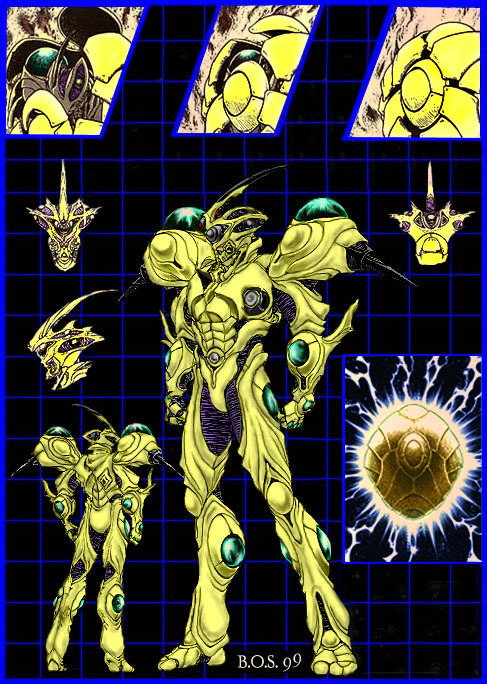 -Unconfirmed reports indicate Unit responds to host unit with the strongest will, so another Guyver can in theory wrest control of unit and force transfer unit upon him or her self, from another Guyver but that Guyver would have to have had previous contact with the Gigantic to establish a link.